Buy New Era 8 Mag Phos in the UK from our online shop or directly from our independent Scottish store. New Era mineral cell salts with biotin. As official New Era stockist, we sell genuine Tissue Salts directly from our shop in Scotland and online throughout the UK. The New Era Treatment Co of London, (later to become New Era Laboratories Ltd.) introduced Luyties’ Combination Tissue Salt, "Elasto", for tired and aching legs to the UK in 1923 and the full range of 12 Single Mineral Cell salts was successfully launched in 1927. These were later followed with the range of Combination Salts designed to meet specific consumer needs as an alternative to making their own mixture of single Tissue Salts. View more products from New Era. Where can you buy real New Era 8 safely online? If you are wondering where you can buy New Era 8 Mag Phos safely online in the UK, then shop with us. We are an actual health foods shop; with real people selling real foods and products. Our award-winning independent shop is located in Stirling, Scotland since 1976. You can buy our Tissue salts and other genuine Tissue Salts in store or safely place an order with us online or over the phone. 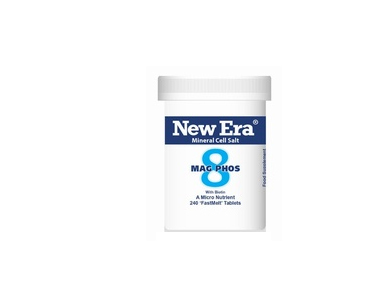 New Era 8 - New Era 8 Mag Phos in Tissue Salts and Homeopathy & Tissue Salts.